We can create a movable floor in virtually any size, making them suitable for a wide range of applications. The Variopool movable pool floors are designed based on a floating concept. The system consists of stainless steel and/or plastic parts and can be configured at the required depth using cables, which are fully equipped to withstand long-term submersion in pool water and can handle a heavy load. Our installers work exclusively with high-quality materials so as to ensure that the system has a lifecycle of over twenty years. The Variopool movable pool floors meet the highest quality standards, also in terms of hygiene. 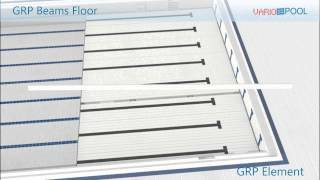 Grids on the pool floor surface guarantee continuous water circulation. The motor of the system is located outside the pool, making it impossible for hydraulic oil to pollute the water. Moreover, the movable floor is equipped with hatches that provide access to divers and cleaning robots for maintenance and cleaning the floor and the space under the movable floor. Next to our floors we also produce and install bulkheads in any size.